The running of the Kentucky Derby takes place the first Saturday of May. Part of experiencing “the most exciting two minutes in sports” is dressing up in classic spring fashions, complete with a glamorous and festive Derby hat. Of course, depending on the style you are enticed by, Kentucky Derby hats can be quite pricey. Some buy them at secondhand stores to save money, but, with an afternoon to spare and a bit of creative flair, you can make your own. First, you’ll need a base to work with. Pick up a sunhat with a large brim at a local gardening section of a box store like Target. There are also flattering hats at costume stores, such as Caufield's, and craft stores—think Dee’s or Michaels—are sure to be stocked with hat bases during Derby season. Remember, the bigger the brim, the more area you have to decorate. Use a hot glue gun and adhere a thick colorful ribbon (wired ribbon is easier to work with) around your hat. It may feel counterintuitive, but glue the seam at the front of the hat. That way, the line of stitching will be disguised with decorations. Remember, with hot glue, a bit of glue is all you’ll need. Flowers are often the main focus of a Derby hat, so select flowers with the color and style you’d like the whole hat to convey. With the hot glue, adhere a large silk flower (or two, or six...it is the Kentucky Derby, why not 12!! ), adding bold colors on a slant, or off-center, to create additional interest. Another option is to add netting or crinoline, folded into loops or tied into bows. Get creative! Try pleats or tufts of gathered fabric, too. Again, hide seams under flowers or ribbons and use the material to fill out the decorated area of your Kentucky Derby hat. Feathers are a great way to add a pop of color, and few feathers can make a big impact. Added bonus: feathers add height to your fabulous Derby hat. Beads, sequins, and jewelry are other ways to add glitter and shine. Take your time, have fun with the process, and create the right hat for you. Made a mistake? Heat the hardened glue with a hair dryer, release adornment, and reattach. Choose a base and color scheme to match your outfit. 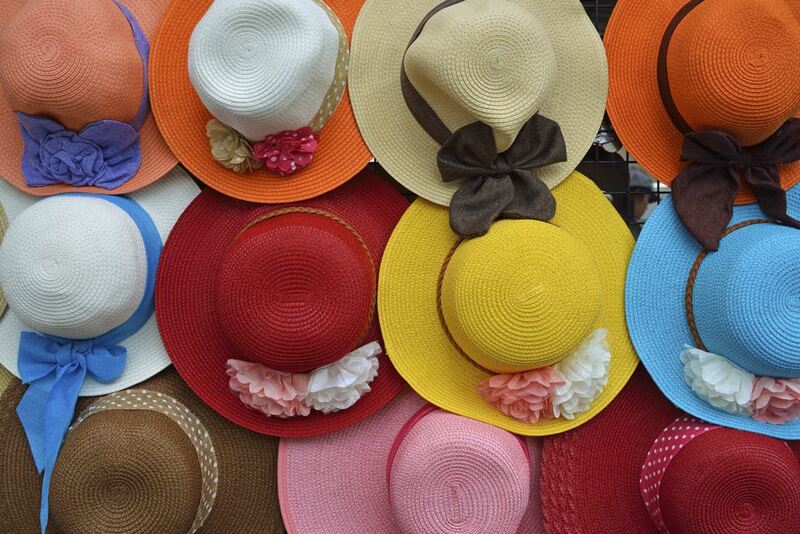 Here’s a guide to where to shop for the Kentucky Derby if you are just getting started. Make it your own! Don’t feel constrained by flowers and feathers, many embellish their hats with their hats with toy horses and/or fake birds. Derby hats are often over the top, so if you are up for a bit of extra attention, go for it. Anything that screams Derby belongs on a Derby hat. Some choose to go with something more playful than classic. Think Mardi Gras beads, saddles, spray glitter, and more. Does your hat have a lot of extra pizzazz? If so, take the time to secure each element. Although hot glue guns are handy, adding a few stitches to each item can ensure your hat will shine throughout a long day of festivities. Voila! Congratulations, whether you are attending Kentucky Oaks, Kentucky Derby, or throwing a Derby party of your own, you now have a stylish hat for the big event.